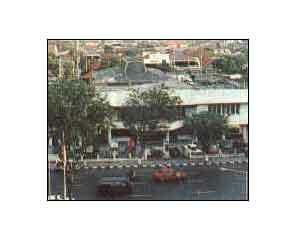 The famous name of this building is Gedung radio Surabaya Simpang weg and is named Pemuda street (Central Surabaya). There was abattle between Surabaya troops and the allied force on 28th until 30th October 1945. There were a lot of victims from the Surabaya people. This building was forced / led by the allied. Finally because of their anger, Surabaya people burnt the building on 29th October 1945 and caused the death, all of the allied troops.